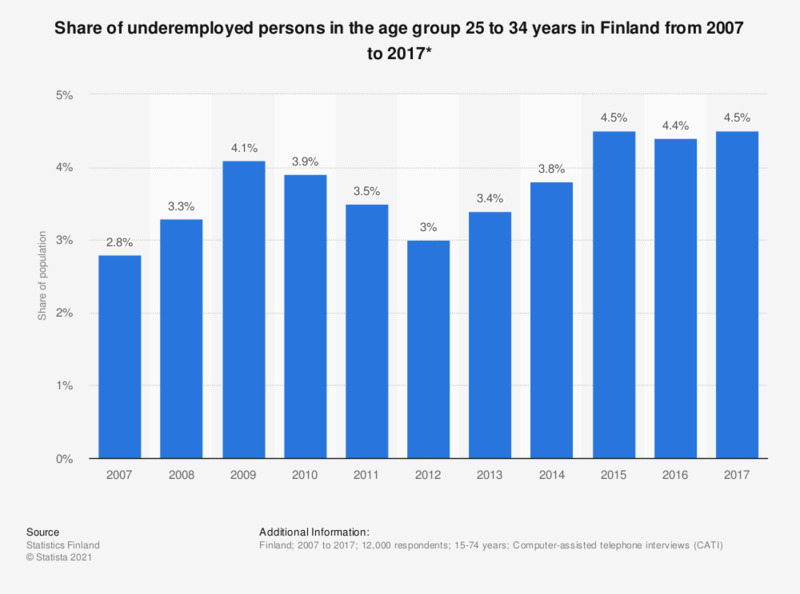 This statistic shows the share of underemployed persons in the age group 25 to 34 years in Finland from 2007 to 2017. Throughout the survey period, the share of underemployed persons aged between 25 and 34 years old fluctuated, amounting to 4.5 percent in 2017. * The Labour Force Survey data collection is based on a random sample drawn twice a year from the Statistics Finland population database. The monthly sample consists of some 12,000 persons and the data are collected with computer-assisted telephone interviews. Statistics Finland considers underemployed as those who are engaged in part-time work because full-time work is not available, or whose employer has them work a reduced working week, or who have had no work due to shortage of orders or customers or because of having been laid off. Thus underemployed is an employed person who would like to do more work.